The Air Saga is a long 40+ quest chain that goes over Crucia and the Storm Legion. It connects and fills in gaps in the main storyline, introduces the aftermath of the Storm Legion, the Bloodfire Army and connects to the Nightmare Tide/Plane of Water storyline. This guide contains a full walkthrough of all the Air Saga quests as well as information on the three new zone events and the Bloodfire Stronghold. Below is a guide to the quests related to the Air Saga. This section is split up into 5 parts that represent the 5 Arcs (quest-chains) of the Air Saga. You will need to complete the Arcs in order. Note: There are numerous quests in Iron Pine Peak that are not related to the Air Saga. This guide will not cover those quests. Use CTRL+F (search function) to find the quest you are interested in and click on the appropriate Air Saga – Arc guide. The first arc begins by speaking to either Cyril Kalmer in Sanctum (Guardians) or with Asha Catari in Meridian (Defiants). The quests are Level 32 and are obtainable at Level 28. The second arc begins with Lord-Protector Nerval at (4633, 1542) in the Chancel of Labors at Iron Pine Peak. The quests are Level 50. The third arc begins with Lord-Protector Nimto at (4633, 1542) in the Chancel of Labors at Iron Pine Peak. The quests are Level 60. The fourth arc begins with General Batua at (13373, 11561) outside the Haunted Terminal in Tempest Bay. The quests are Level 60. You need to complete ‘Arc 3: The Bomb‘ in order to start this quest. 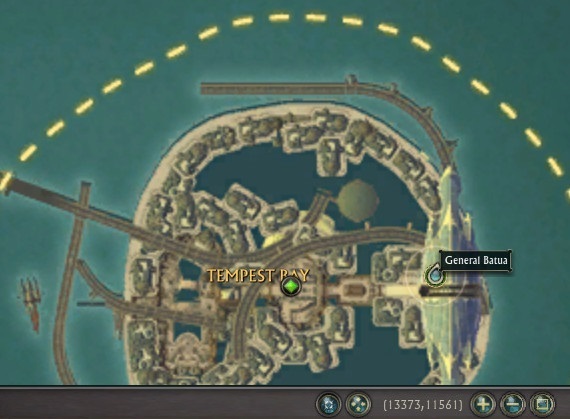 The fifth and final arc begins with General Batua at (13373, 11561) outside the Haunted Terminal in Tempest Bay. The quests are Level 60. You need to complete ‘Arc 4: An Approaching Inferno‘ in order to start this quest. The Bloodfire Stronghold is a new instance with 6 boss encounters. There are Level 15, 30 and 60 versions of the boss encounters so they are accessible to most players. Killing Bloodfire Stronghold bosses rewards an Ember Core item that is used to upgrade your Torrid Ember into a Magma Walker Mount. There are altogether 3 new zone events appearing with the introduction of the Air Saga. These are the “Bloodfire Behemoth”, “Bloodfire Army” and “Power of Nightmares” zone events. The Bloodfire Behemoth zone event will begin spawning across the zones in Mathosia, Brevane and Dusken with Phase 2 of the Air Saga World Event. This zone event is fairly simple – Locate the boss by going to the areas marked and finding a dust storm. Use the zone event item that is shown on the zone event tracker to hopefully reveal the boss. Once revealed, you kill the boss to complete the zone event. You will be rewarded with some of the usual zone event rewards as well as an Infernal Conduit item. This is used to enter the Bloodfire Stronghold and summon bosses within. Note: Make sure that the boss is at least Green to you (you may need to Mentor down by right-clicking your Portrait whilst you are stationary and choosing “Set Ascended Mentor level”). Otherwise, you won’t get the Infernal Conduit item. The bosses for the Bloodfire Behemoth differs based on which zone the event spawns in. Each have their own mechanics. 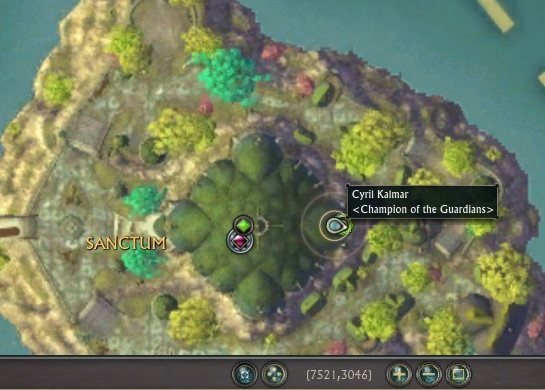 Commander Rognyre spawns in Freemarch, Silverwood, Stonefield and Gloamwood. 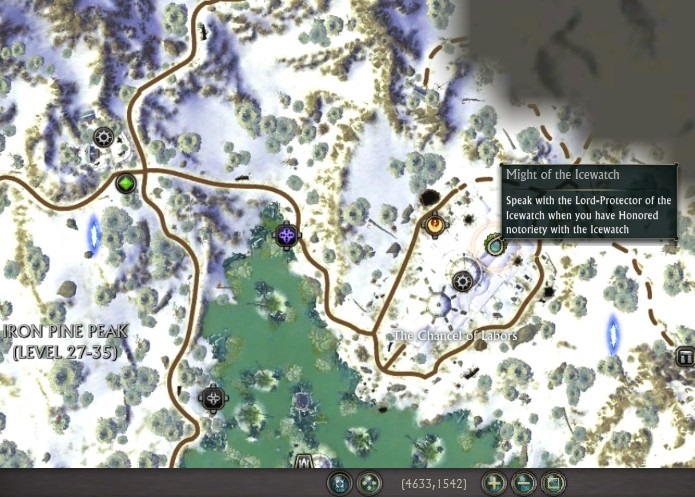 Lord Warfyre spawns in Iron Pine Peak and Scarwood Reach. Oldoron the Charred spawns in Droughtlands and Ember Isle. 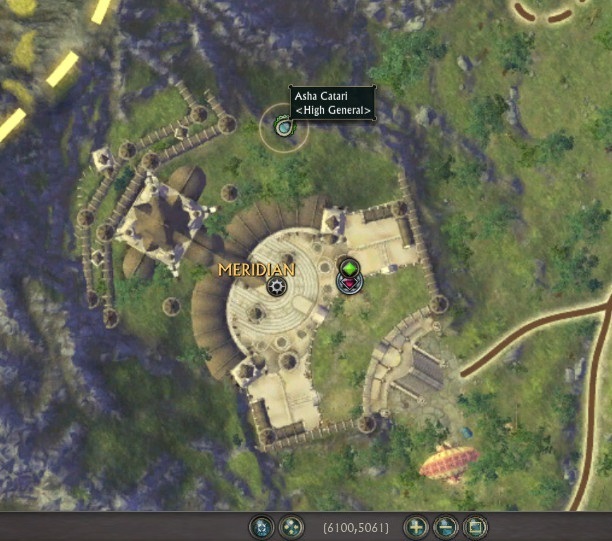 Herodithus spawns in Kingdom of Pelladane, Cape Jule, Seratos, Eastern Holdings and Morban. Amon T’Drok spawns in Ashora, The Dendrome and Steppes of Infinity. There are altogether 340 achievement points related to the Bloodfire Behemoth zone event under Achievements -> Planes -> Fire. Kill Boss in any zone. 10 points. Complete the zone event in the specific zone. 5 points. Be the player to reveal the boss (using the temporary zone event skill). 10 points. Bane of the Bloodfire is received for completing all “Bloodfire Behemoth: Zone” achieves for completing the zone event in each zone. Title reward: “Bloodbane”. Bloodfire Hunter is received for completing all “Behemoth Hunter: Zone” achieves for being the player to reveal the boss during the zone event in each zone. Title reward: “Huntsman” or “Huntswoman”. Players seem to be confused with how Amon T’Drok incoming damage reduction stacks work. Amon T’Drok gets stacks of Hardening Ash that reduces incoming damage by 10% per stack. You destroy this with Volatile Gas Explosion. Volatile Gas Vents spawn from a random player that gets a purple pulsing AoE. After a few seconds of the purple AoE pulsing, it will drop and spawn the Volatile Gas Vent. The Volatile Gas Vent will cause a Volatile Gas Explosion that will remove Amon T’Drok’s Hardening Ash stacks. However, you need a player who is pulsing yellow/firey glow to stand on top of the Volatile Gas Vent. Any works – doesn’t need to be one that is on top of Amon T’Drok. A random player will gain a pulsing yellow/firey AoE. They need to stand near a Volatile Gas Vent to make it explode, causing a Volatile Gas Explosion that is needed to remove Amon T’Drok’s Hardening-Ash-incoming-damage-reduction stacks. The Bloodfire Army zone event is a fire/air-based zone event that begins spawning beginning with Phase 3 of the Air Saga World Event. This zone event rewards twice the amount of usual rewards for a zone event (i.e. 2x Marks of Notoriety, 20x Crystallized Insight, 660 IS/etc). It has a chance of dropping the Cerulean Crocnard mount. You also have a chance during the 4th and 5th stage of the Sinister Tide Lure you can get from Rift Store -> Rifts. The zone event involves killing 30 Bloodfire Invaders before shattering 30 Dissonance Crystals around air footholds. During stage 2 of the Bloodfire Army zone event, shield icons will appear on the map indicating locations of Air footholds with Dissonance Crystals around them. Shatter them to progress the event. To Shatter the Dissonance Crystals, click on the quest item icon “Hammer of Shattering” next to the “The Bloodfire Army”‘s tracker (usually found above your quest stickies). You’ll get a ground-targeted AoE icon when you click on the quest item. Hover the icon on top of a Dissonance Crystal close to you to shatter it. After it’s simply a matter of defeating Xumpothazon, the boss. Be aware that his Pyroclastic Flow attack hurts and seems to be %hp based (as it absolutely wrecks tanks) – but other than dodging that cone attack everything else shouldn’t pose an issue. A single achieve “Xumpothazon… How Do You Say It?” is available for the Bloodfire Army worth 5 points found under Achievements -> Planes -> Fire. The Power of Nightmares zone event is a water/air-based event that begins spawning beginning with Phase 3 of the Air Saga World Event. The zone event involves banishing water creatures that are surrounded by the Storm Legion. Destroy the Storm Legion around each water creature and use the reactive you receive to Banish them. Afterwards, close 10 Water Rifts and then stop Crucia by defeating the Unclean Beast. The final boss for this zone event is the Unclean Beast. In Steppes of Infinity he can be found at the Zerzala porticulum. A single achieve “Cleaning That Which Is Unclean” is available for the Power of Nightmares worth 5 points found under Achievements -> Planes -> Water.